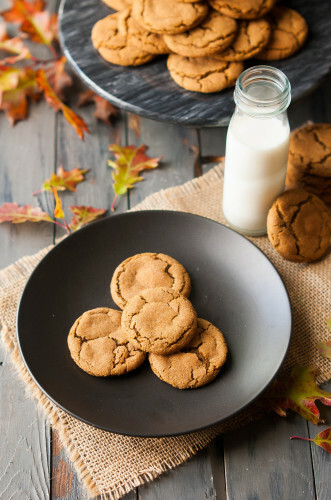 As I’ve mentioned before, I happen to have the BEST GINGERSNAP COOKIE recipe in the world. No joke. 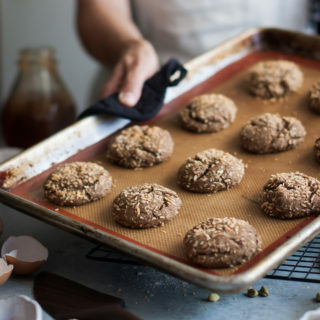 They are soft, but perfectly chewy and a little spicy and are my absolute favorite cookie ever. I make them all the time, but sometimes I like to use the dough for more than just a simple cookie. 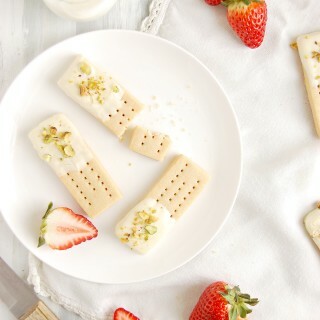 3 of my favorite fall flavors in one perfect bite(or four). Obviously, the cookie cups are, as mentioned above, a soft and chewy, spicy gingersnap cookie. 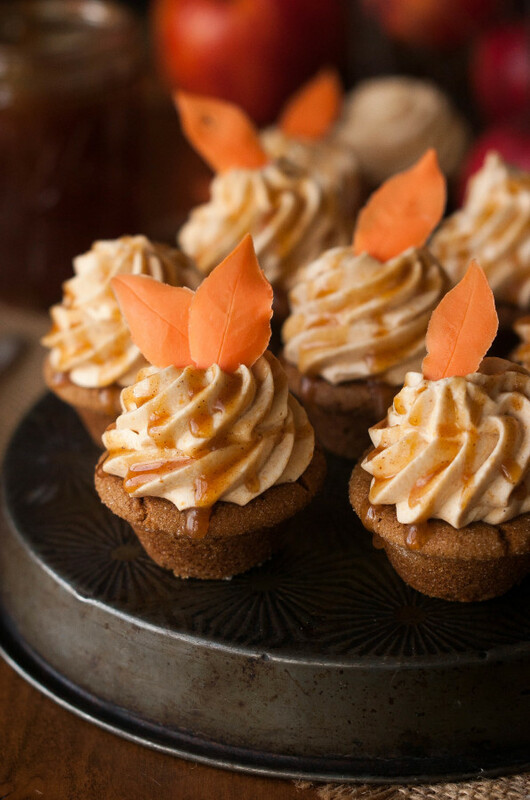 The cookie cups are filled with a super easy, quick Pumpkin Mousse. If you have 5 minutes, you have creamy, light and fluffy pumpkin mousse. 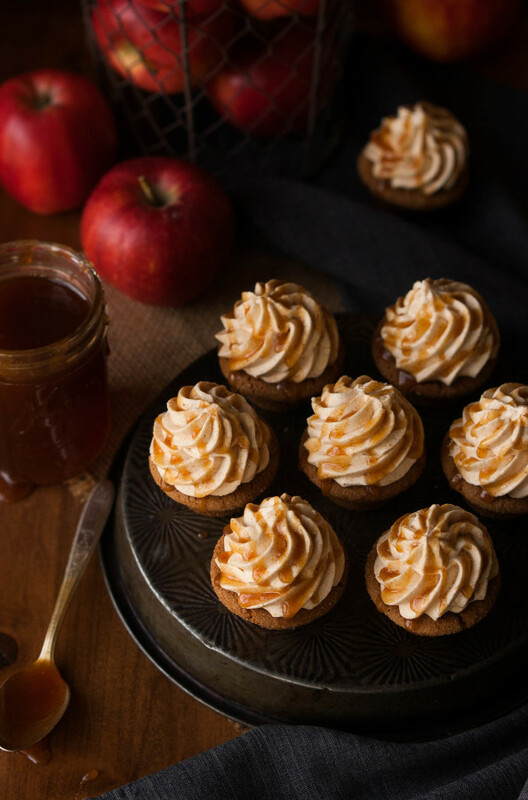 The topping is a cider caramel, spiced with cloves, cinnamon, and allspice and made with apple cider instead of heavy cream for a glossy caramel reminiscent of a cup of seasonal apple cider. 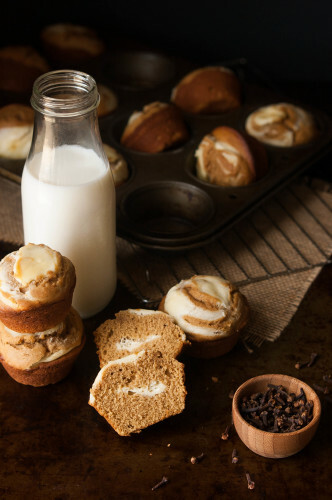 These cookie cups make a great treat for a holiday party. All components can be made ahead of time and assembled whenever you need them. The caramel can even be made weeks in advance, if needed, and kept in the refrigerator. I don’t know about you, but I always have a jar of some sort of caramel in my fridge. 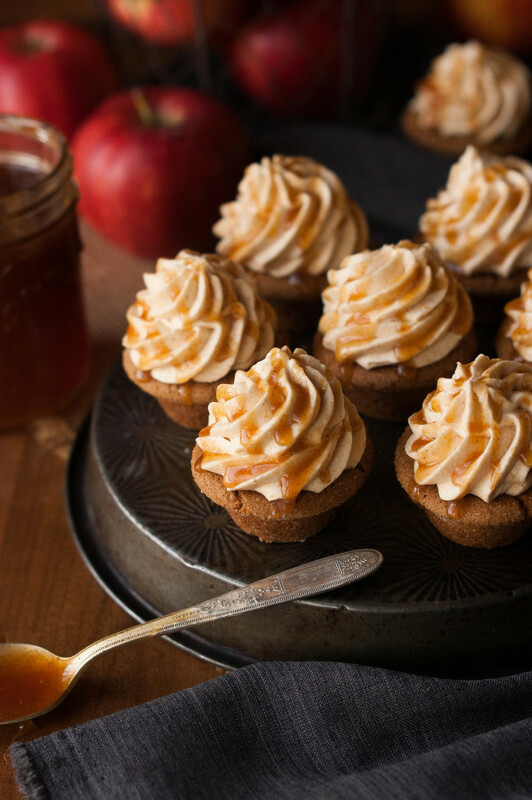 Browned Butter Caramel, Cinnamon Caramel, Peach Caramel, you name it. Caramel and I are good friends. 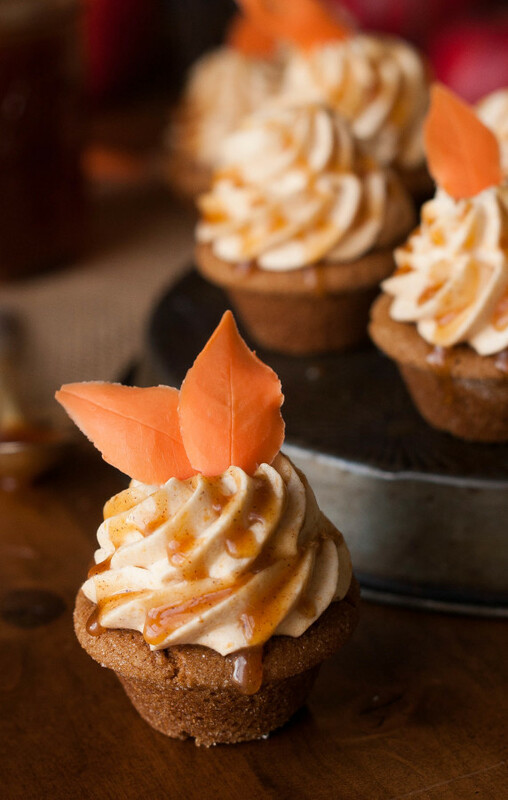 I topped a few of these cookie cups with chocolate leaves made from orange chocolate melts for a little extra Autumn flair. Melt orange chocolate melts( I used Wilton brand) in a small, microwave safe bowl, microwaving at 30 second intervals, stirring after each until melted. Find a handful of small leaves, and gently wash and dry them. Paint the melted chocolate on top of each leaf, enough to cover the surface of the leaf, and set on a plate covered in parchment paper. Refrigerate until set. Carefully peel the leaf off of the chocolate and use the chocolate leaf as a garnish. Make the gingerbread cookie dough according to recipe directions, including dividing the dough into 36 pieces, rolling into balls and coating in sugar. Place each sugar coated cookie dough ball in a well of a mini muffin pan. Using your fingers, press a hole in the middle of each dough ball and press the dough up against the bottoms and sides of each well, forming a cup. 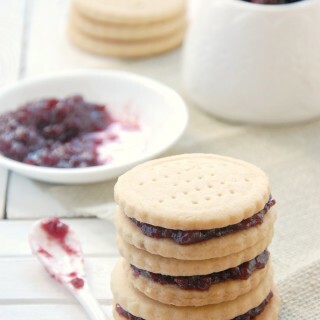 Sprinkle a little bit of sugar in the cookie cup while pressing if you find it is too sticky. Bake according to recipe directions, upping the bake time to about 11-12 minutes. Remove cookie cups from tin by pressing each cup down lightly with your fingers as you gently twist. Pull out. Place the pumpkin, sour cream, pumpkin pie spice, and lemon juice in a medium mixing bowl and whisk together until smooth. In another bowl, add the heavy cream, sugar, and vanilla and whip to very stiff peaks. 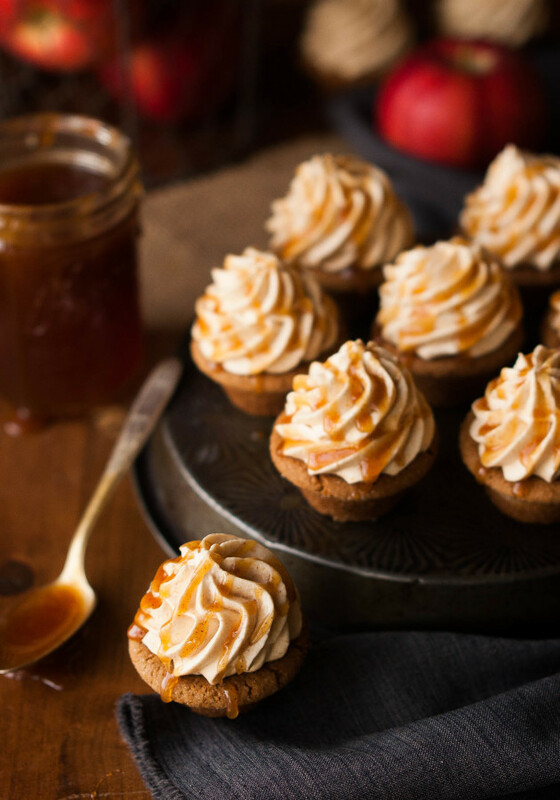 Using a rubber spatula, scoop the whipped cream into the bowl with the pumpkin mixture and fold in gently, until thoroughly combined. Scoop the mousse into a large piping bag fitted with a large star tip. Pipe the mousse onto the cooled cookie cups. 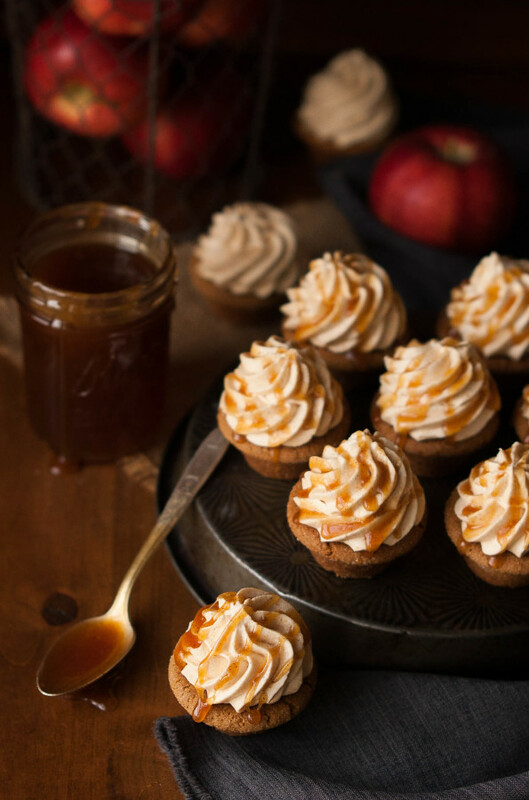 Drizzle cider caramel over the mousse in each cookie cup. Place the sugar and water in a medium non-stick saute pan. Stir together until all the sugar is moistened. Place on medium heat, swirling the liquid on occasion, until sugar is dissolved. Run a pastry brush dipped in water over the sides of the pan to dissolve any remaining sugar crystals. Meanwhile, place the cider and spices in a microwave safe bowl and heat for 1 minute. Up the heat to medium/high and let sugar continue to cook until it turns a medium amber color, swirling the sugar lightly with the handle of the pan to help it caramelize evenly. Pour the hot cider and spices into the caramel. Mixture will bubble intensely. Add the butter. Stir with a heat proof spatula and continue to cook until the mixture settles down and caramel is smooth. Remove from heat and pour into a glass mason jar. Let cool. Can be kept in the refrigerator for several weeks. 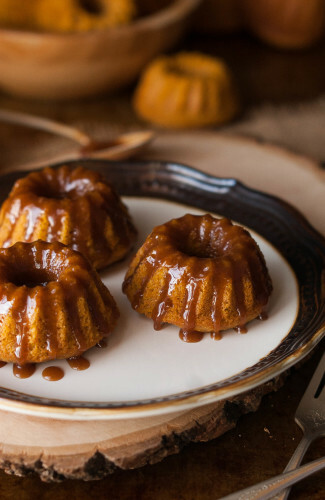 If caramel is too hard when needed for drizzling, microwave for 20-30 seconds and stir.